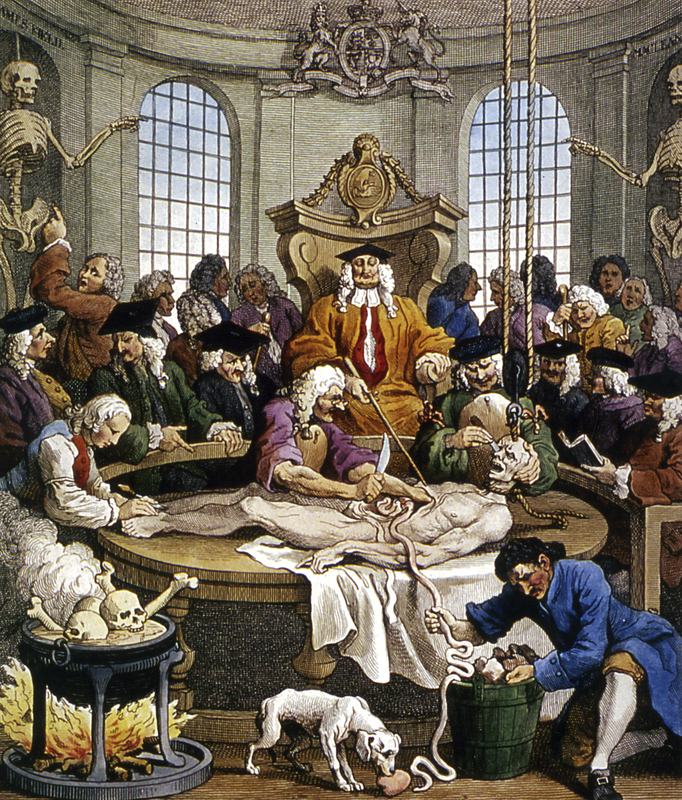 William Hogarth (1697-1764) was an engraver specialising in satirical comment, and his view of doctors was not flattering. Here, the fictional criminal, Tom Nero’s dead body has been delivered to be anatomised. However, the gouging and cutting appears to no purpose, and the doctors read, talk, and pay no attention at all. This is the fourth of four engravings in a series. In the first, Tom, as a boy, tortures a dog; in the second, as a young man, he beats a horse; in the third, Tom is caught in the act of violent murder. Finally, the dog gets its revenge as it eats Tom’s heart. Robert E. Greenspan, “‘The Reward of Cruelty’ (1751) by William Hogarth, reproduced from Medicine: Perspectives in History and Art. ,” ourheritage.ac.nz | OUR Heritage, accessed April 22, 2019, http://otago.ourheritage.ac.nz/items/show/11081.